The 500 Festival Mini-Marathon is an amazing event hosted here in Indianapolis each May. Runners from around the globe (literally) all descend on Indianapolis with one goal in mind: to conquer the 13.1 miles set before them. Not only is this race the kick-off to the 500 Festival, it's the largest half-marathon in the world. This year is the 39th year for the race, and it's expected to sell out its 35,000 spots once again. It's an exciting time - one that's fun to be part of, whether you're running or volunteering. Perhaps you signed up for this year's Mini-Marathon, but you've never trained for a half-marathon before. If that's the case, read the following tips and tricks from former runners so that you know how to train without losing your mind. Some people go into the race thinking that they can complete it after a few 5 mile runs. While that might be true, we recommend instead following a detailed plan for months leading up to the race. There are lots of established training plans out there that you can choose from. We suggest training at your own level. If you're not an Olympic athlete, then don't try to run at those speeds. If you've already run one and want to try to improve your speed, you might choose a plan like this. After you decide your training plan, adjust it to fit your schedule. If it suggests running on Monday/Wednesday, but Tuesday/Thursday works better for your calendar, then do it! Make your training fit into your life so that it's enjoyable. Do whatever it takes to get yourself excited about the race. For some, that may include some bribery ("After I complete my long run, I'll treat myself to some ice cream.") For others, like Heather, that meant purchasing some music, "A solid playlist was key for me during my training. I bought Spotify, and I still have the App because it's amazing! I recommend Kanye's Workout Plan!" Motivate yourself accordingly so that you're able to meet your goals. While training, you're going to be burning a lot more calories than you normally do, so you'll want to adjust your diet accordingly. You might want to have a snack before running in order to give yourself some extra energy. Or you might eat a banana afterwards to help prevent cramps. For long runs, you could consider using energy gels (sold at running stores). Or, as running pro Allison says, "Test different food combos while training. Gels make me sick, so I use baby food packets." Whatever you do, make sure you're drinking enough water. Hydrate yourself well throughout the whole process. Not only is it good for you, it will help you go the distance when it comes to training. If your body is in pain (we don't mean being sore from a workout), then you should probably take a break from running. Missing a few days of training is better than worsening your injury. If your pain is bad enough, don't hesitate to contact your doctor. It's no surprise that your feet take a beating during training - and the race. 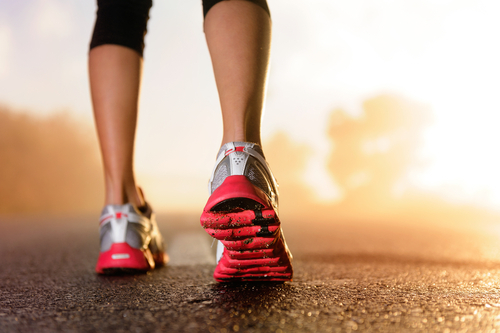 Running in poorly-fitted shoes can result in blisters. We recommend that you get fitted for shoes (at stores like Blue Mile or Runner's Forum) that will work best for your gait. You'll also want to ask about purchasing shoes that are a bit bigger than normal to account for swelling. Purchase your shoes early on, and wear them throughout your training so that you can break them in. You can also take care of your feet by taking steps (pun intended) on the day of the race. Runner Stephanie suggests, "I vaseline my toes and wear socks that are like foot gloves for the race. My feet felt great!" The Mini-Marathon is a fun event. There's excitement in the air; the crowds are cheering you on; the bands are playing. Whatever you do, enjoy the process - and especially the race. You've earned it!